Superdry women’s utility dungarees. These distressed design dungarees are a must for all denim lovers, they are a great item to layer with classic stripes to create a timeless, mariner style outfit in your wardrobe this season. The utility dungarees feature a brace buckle fastening, a side button fastening and four handy pockets. 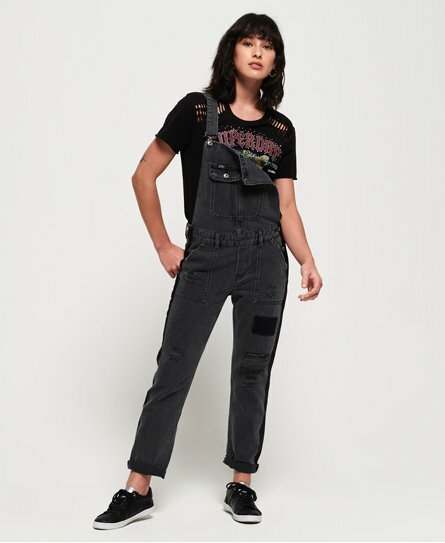 In addition, these dungarees have a further pocket on the chest, belt loops and a leather Superdry patch on the waistband. For the finishing touch, the utility dungarees have been completed with a Superdry patch on the pocket and Superdry branded buttons and rivets.